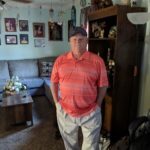 Hampton, Va Jamey Glenn Leonard, Sr., 59, passed away on Monday, April 1, 2019. Jamey is survived by his wife Johnna Leonard; two sons, Jamey Leonard, Jr. (Wendi) and Robert Leonard and three grandchildren, Skylar Cummings and Abel and Axel Leonard. He is also survived by two brothers, Jimmy Leonard (Becky) of Newport News and Bobby Leonard (Juanita) of Toano; and many nieces and nephews. A funeral service will be held on Saturday, April 6, at Noon at Breakthrough Worship Center, 1709 Hampton Highway, Tabb, VA, 23693. Interment will follow at Peninsula Memorial Park. The family will receive friends on Friday from 7-8 pm at Amory Funeral Home, Grafton.